Vacation rental house. Sleeps 13, 4 bedrooms, 2.75 bathrooms. No pets allowed. Welcome to ‘Barranco’ (named after a charming high bank neighborhood in Lima, Peru)! 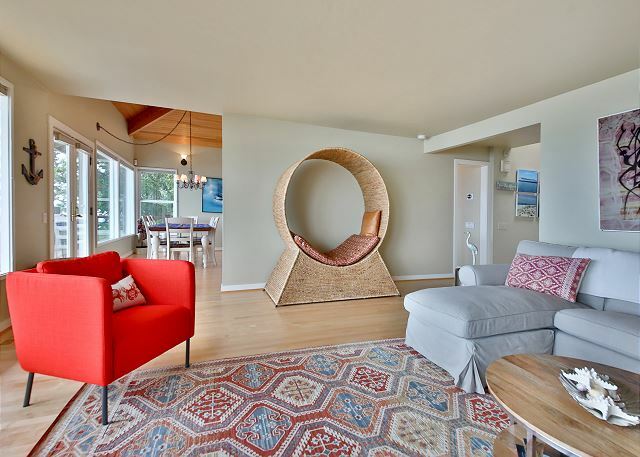 This contemporary waterfront home, high on the south west facing bank, is just a stone throw from South Whidbey State Park and situated on one of the most magical and secluded spots on Whidbey Island. 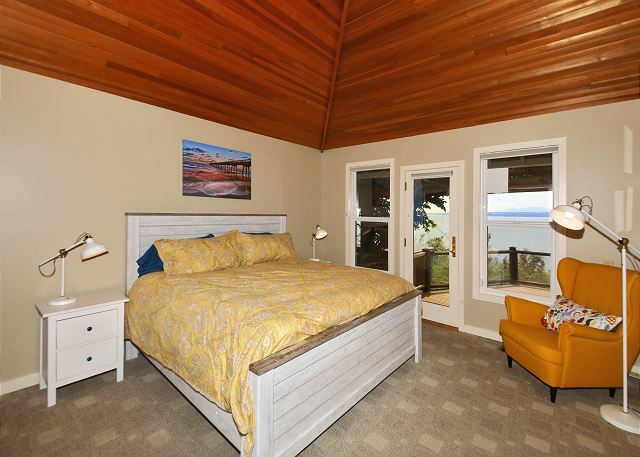 With captivating panoramic views of the Sound and Olympic mountains and a private stairway (approx. 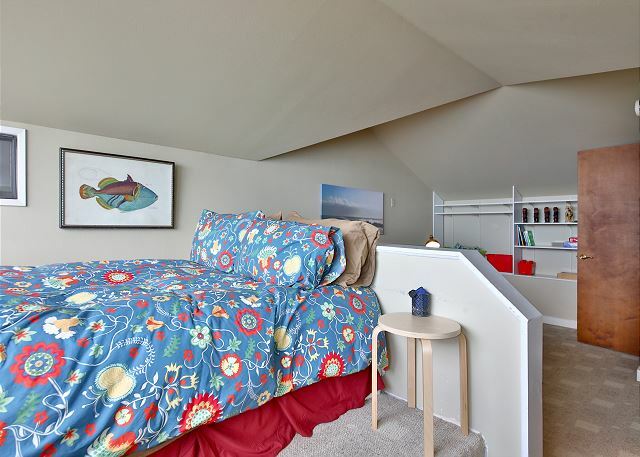 100 steps; a 3-4 minute moderate hike path to 4+ miles of sandy walking beach, this home provides an ideal getaway for families and groups seeking beauty, solitude, inspiration and fun. Enjoy stunning sunsets, campfires, constructing driftwood forts, salmon fishing, and hikes through the nearby State Park old-growth forest. 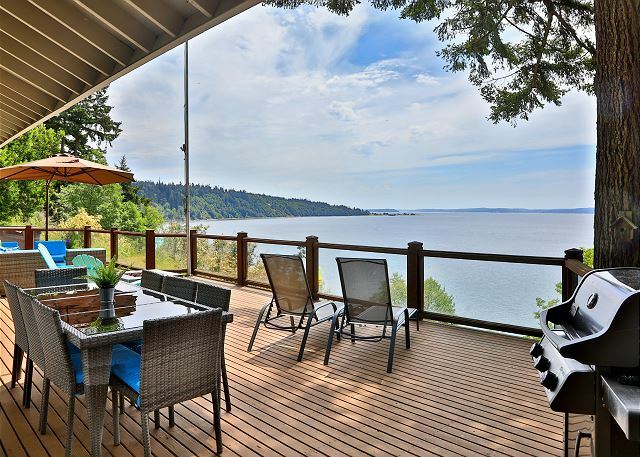 The home features an entertainment deck with gas fire pit to sit, lounge, entertain or enjoy a good book while keeping an eye on the snow topped Olympic Mountains, shipping lanes and wildlife (Eagles, Whales, Seals). 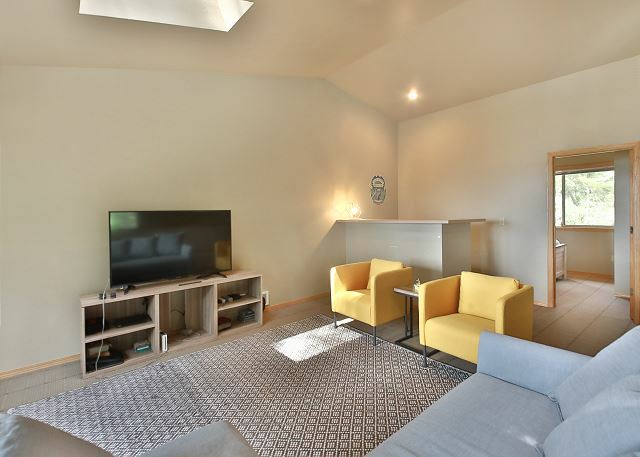 The property also features a Chef’s Kitchen, Open Concept Living Room with Gas Fireplace, a Saltwater Hot Tub and a separate detached unit with a large recreational game room (Ping Pong, Shuffleboard, Air Hockey, Pop A Shot Basketball, Children’s Corner) and guest loft/apartment. There were six adults and two children at our gathering. The kids were very happy the whole time. Between the beach, the hot tub, the outings and the games in the garage there was plenty to do. We all agreed we would definitely like to return! Thank you for your comments. We are so happy that your stay on Whidbey Island was "wonderful". We hope we can help you with your next stay on the island. Went here on a couples retreat with a few kids. Our favorite aspects were the game room, the walk down to the water, the view, the space. One flaw- it took almost 12 hours to get the house to heat up. We were freezing and wearing our jackets until we woke up the next morning. Maybe the property manager could come in the day of someone’s arrival and turn the heat up that morning? Would definitely come back though. This place was gorgeous! Thank you for your comments. We are happy you had an enjoyable stay on Whidbey Island. We regret the house was not warmed when you arrived we try to make sure the heat is turned up on the homes we rent. Please let us know when you are returning to the Island so we can help you with your next stay. I booked Barranco as part of a family get-together to celebrate the life of a dad who cared deeply about nature and worked to preserve beautiful places. 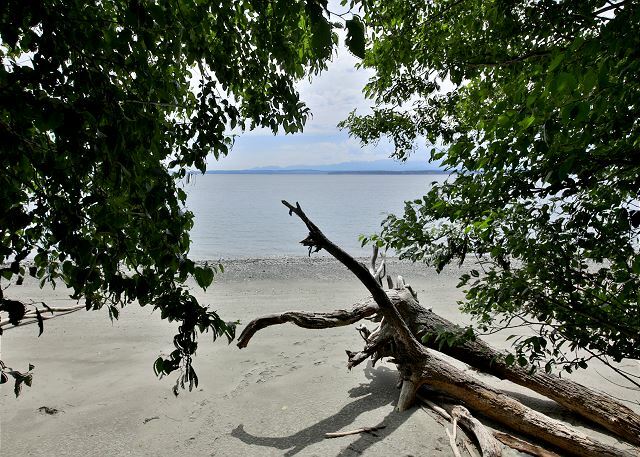 He lived and worked on Whidbey after the nest in NY's high peaks region was empty. Seeing this area was 'a first' for many of us, and all agreed I "done good." Barranco was a great choice to appreciate the splendor. It is impossible to do do the views justice with pictures on a computer screen! 9 of us occupied the main house with 2 extra in the game house and 2 on couches on one peak night. The house could easily handle more, but it is hard to get septic systems in these locations to go along with large crowds. A slight odor seemed to be related, but the laundry room vent fan helped. We tried to be thrifty with water use while at the house, which we were a lot! A staycation away from home! We spent a lot of the week on the deck and in the kitchen. The hot tub saw a lot of use as well. Walking up to the park or down to the water were regular treks. Ventring out.. Coupeville! Deception Pass! Double Bluff! Then back to Barranco! The kitchen had enough to do most things. The lighting took a little experimentation and some switches seemed broken. Some door latches were sticky. But really, it takes effort to find things to complain about with Barranco. We will be remembering and talking about our week here for a long time. Thank you so much for your review! The owner had us look into the smell and fortunately we found the issue and it has been remedied. We are sorry for the inconvenience, but so happy to hear you had such a wonderful time regardless! Now Barranco is even that much better! :) We hope you can come and stay again! A Wonderful Property for a Big Group! We stayed here for five nights over July 4th - my husband and I and six young adults. The house was perfect for our large group - in the main house, a bunk room with three singles; a lovely king suite; and a room with a queen bed under the eaves with an incredible water view. In the "guest house" there is another queen bedroom and a pull-out couch that could be used for a few more guests. The deck with hot tub is a dream. We spent most of our time lounging there, reading, sitting around the fire-pit, and barbecuing on the fabulous grill. The kitchen is also very well stocked with plates, cups, silverware etc. for a large group. They could use a few more baking sheets and such, but overall an amazing kitchen. The property was mostly clean, although the windows had a lot of streaks and there were a few cobwebs on the lamps and such. The bedrooms and bathrooms were very clean. There was a large supply of towels in the excellent laundry room. There were a couple of mechanical issues, such as the handle on the door to the back deck, which was loose and kept falling off, but I trust this will be repaired for the next guest. 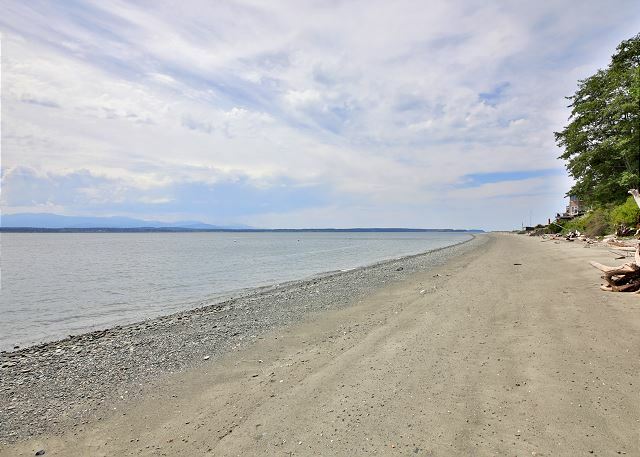 South Whidbey State Park is within easy walking distance, either by the beach or along the road. We enjoyed visiting Greenback Farms and bringing back fresh pie! Watch your step on the walkway down to the beach - it needs a bit more maintenance, but once you get down there it is lovely. Eagles were nesting close by and we saw them fly past the deck many times a day - breathtaking! Thank you for your comments. We are happy the house was "perfect" for your needs. We will make the necessary repairs to make your next stay on the Island more "perfect". We hope to help you with your next stay on the Island! This was a wonderful place for an extended family (13) to gather over a family wedding weekend. It was an easy 20 minute drive to the wedding venue (Fireseed Catering), the view was gorgeous (looking across the water to the Olympics), it was quiet, and the layout was perfect for simultaneous card games at the dining room table, conversation and/or relaxing in the living area, and more of that on the deck. Beach walking and the game room entertained several of the crew, and a dip in the hot tub with the nearly full moon shining on the water was a great bonus. We would return to this place if an occasion came up, and we give it an enthusiastic recommendation. Thank you for your comments. We are so happy that you had such a "wonderful" time on Whidbey Island. We hope we can help you with your next "perfect" stay on the Island. A Great Family Get Away! My family group of 11 had a great weekend in this beutilful home! The property managers were very helpful and responsive to our needs. There was plenty of room and the "gym" set up in the garage saved the day for our grandkids when it poured rain! The beach is perfect for beach combing and the view from the comfortable deck is magnificant! Thank you for your comments. 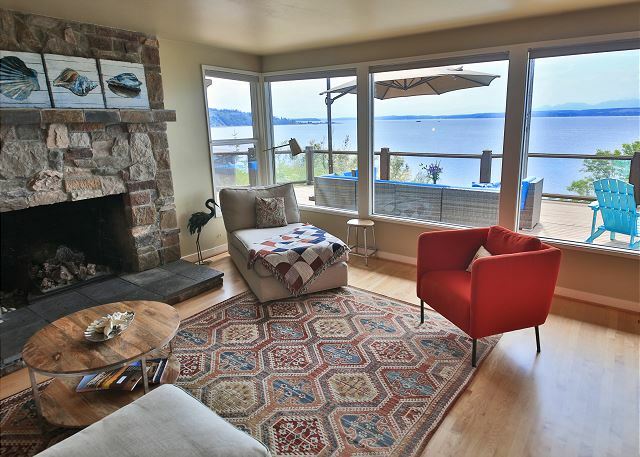 We are happy that you enjoyed the home you stayed in on Whidbey Island. We hope we can hlep you with your next stay on the Island. Great house and play room. Everyone had a great time. A couple things the door handle needs repair on door to deck. and I think you need to let people know about the walk to the beach in your property description, and repair some of the steps. Some in our party were unable to make it to the beach. Thanks for the feedback. It was great having you stay with us! 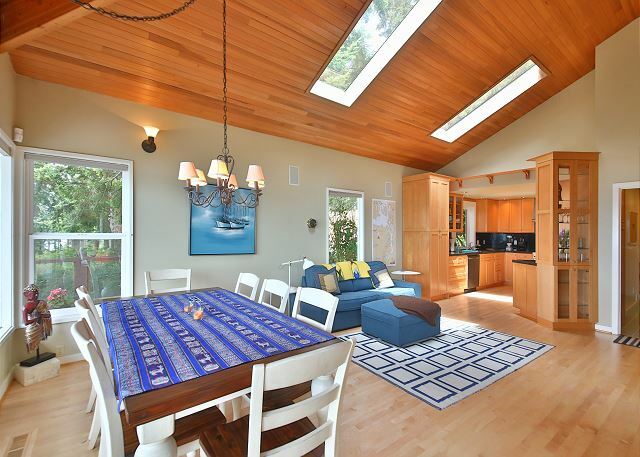 We have updated our listing to reflect the fact that it’s a short hike down to the beach. Our apologies go out for any inconveniences. We have tightened the door handle on the deck also. Thank you again for letting us know.